The release of MariaDB Platform X3 brings together MariaDB TX for transactions and MariaDB AX for analytics into a powerful solution that can tackle a wide range of data management requirements. Production installations of MariaDB Platform are tailored to the requirements of the given application. Factors like read/write mix, OLTP queries versus analytics queries, high availability requirements and much more will drive different topologies for production clusters. 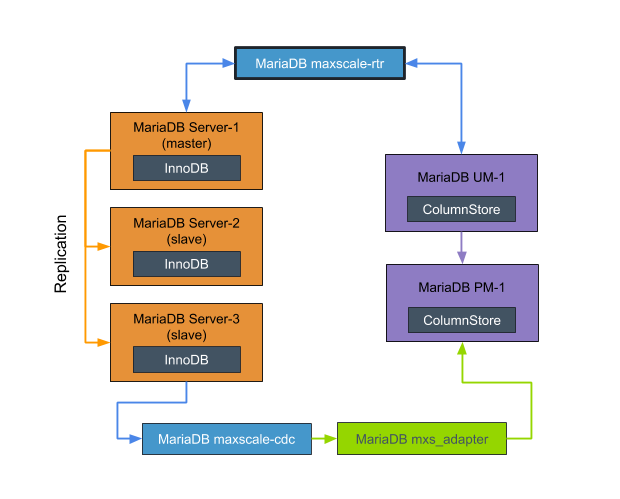 These setups can vary from a single MariaDB Server with InnoDB storage fronted by MariaDB MaxScale all the way to a globally distributed cluster that includes MariaDB ColumnStore for analytics. With all of these setup options, the choices can seem daunting! But what if you just want to get hands-on with all of the components of MariaDB Platform as quickly as possible? That is where the MariaDB Platform Single Container Image steps in. The Single Container Image combines MaxScale, a MariaDB Server Master/Slave/Slave setup, MariaDB ColumnStore running a single UM and a single PM, and the necessary CDC components into one Docker image. I should note that this image is intended for test and development purposes. MariaDB Platform is supported on Docker for production installations, but those installations should be based on laying down many of the individual components into their own containers. Please visit our Single Container Image Github to get more information and feel free to log a github issue if you spot something or even if you just have a suggestion. Thomas joined MariaDB in 2017. He brings 25 years of experience in the IT industry, with a strategic focus on databases and data storage technologies. Prior to MariaDB, Thomas worked at Oracle, Hewlett-Packard, MongoDB, as well as with smaller startups and as an independent consultant in the San Francisco Bay Area.